Q. I need help finding a specific article. Kellner, Rivka Temima. "J.K. Rowling's ambivalence towards feminism: House elves -- women in disguise -- in the 'Harry Potter' books." The Midwest Quarterly 51.4 (2010): 367. 1) Go to nvcc.edu/library and click on the Articles tab. Select Find Journal by Title. 4) You will see a listing of databases in which the journal is available including the date range in which it is available in full text in that database. Click on the linked name of the Database in which you would like to view the journal. You might see that the journal is available at a campus library which means that journal is available in print at that specific campus library. You might also see that the journal is available online at the journal's website. 5) Sometimes the link will take you to a landing page for that journal; other times the link will take you to a generic search page where you have to search again for the journal title. 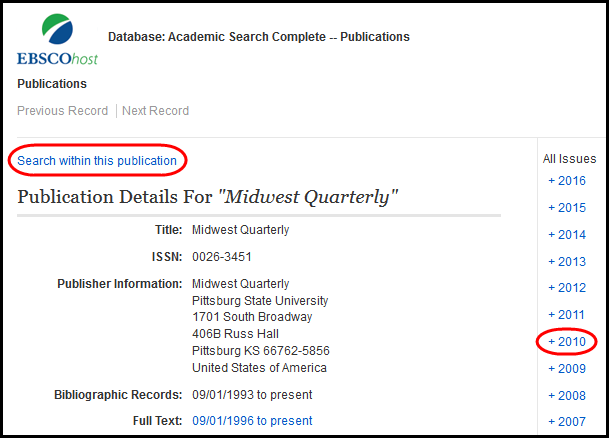 In this example, clicking the link for Academic Search Complete will take you to a landing page for Midwest Quarterly. You can either "search within this publication" or browse by issue. 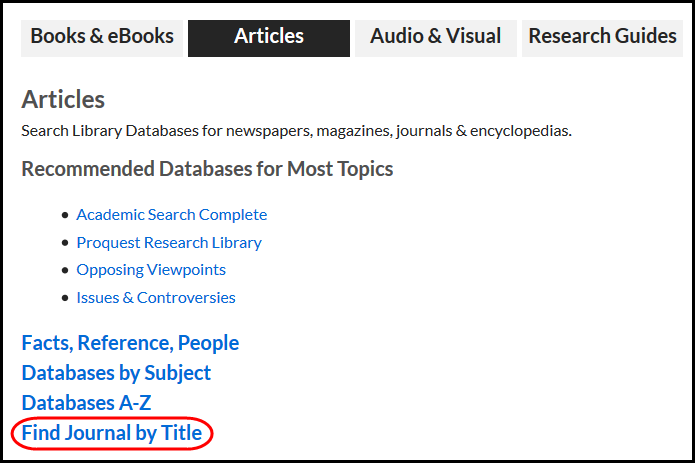 6) If you decide to "Search within the publication," the database will automatically include information in the search box for the journal (be sure to leave this information). On the second line, type the author's last name, which is Kellner in this example. Keep in mind that databases have different layouts and search features.